Bassano del Grappa is an important city of interest, world- known for its fine Grappa. 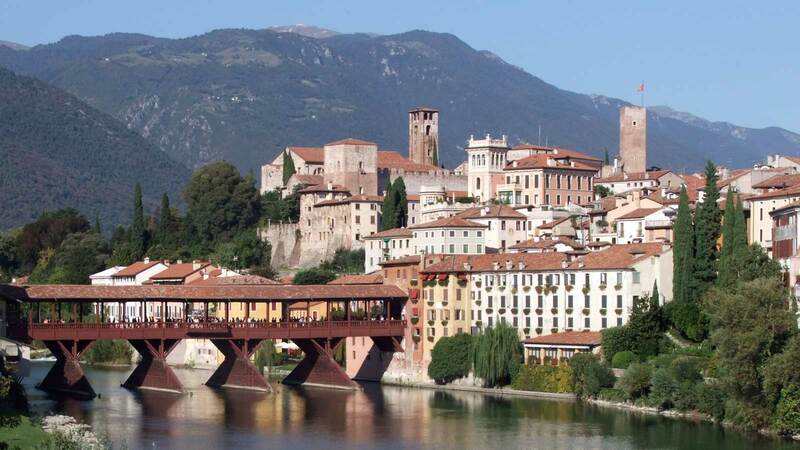 Bassano del Grappa is crossed by the Brenta river, which has always been an extremely important water way and a connection point between the mountains and the plain. Bassano is situated at the feet of the Montegrappa and dominated by the Castello Superiore, a 13th century fortress. Walking in the city, you can recognize the medieval Piazza della Libertà, the main square, and see some stretches of the ancient city walls and gates. The Ponte Vecchio is the symbol of Bassano del Grappa and its most known attraction, by which it’s a must to have a Grappa at Nardini’s. The bridge is a wooden bridge. It was originally projected by Andrea Palladio, but it was demolished and rebuilt many times during the centuries because of the river floods. In Bassano del Grappa you can even find a museum dedicated to the Grappa, the Poli Museum, where you can discover all secrets about its distillation. If you want to taste Grappa, you only have to go to one of the many distilleries we have in the area. Bassano is word-known for ceramics too and the Palazzo Sturm hosts a rich collection of ceramics, which testifies this flourishing handcraft activity in the city. In the center you can still find some ancient workshops selling handmade ceramics, which are together with a bottle of Grappa, the greatest souvenirs you can take home.